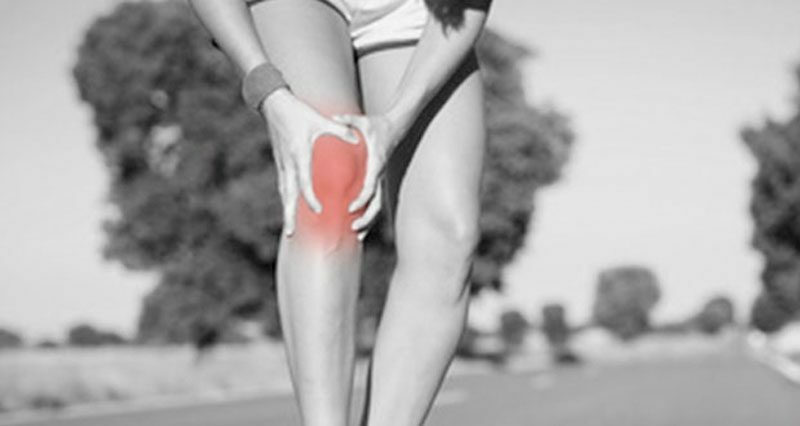 Anterior knee pain is pain at the front of the knee including the patella or kneecap. The two most common causes of pain at the front of the kneecap are patellofemoral pain and patella tendinitis, also known as Jumper’s knee. Here we outline the causes of pain at the front of the knee. Other causes which should always be considered. Also known as runners knee, patellofemoral pain syndrome is a generic term used to describe patella pain at the front of the knee, often caused by overuse. Tenderness on the inside of the kneecap is a sign of this injury, and swelling may sometimes occur. Pain may get worse when walking up and down hills or after long periods of sitting. There are a number of factors which can increase the risk of suffering patellofemoral pain including incorrect running shoes for your running style, increased training loads, training surfaces as well as biomechanical issues such as overpronation, increased Q-angle of the knee or muscle imbalances. Treatment and rehabilitation are based on reducing symptoms, identifying the causes and strengthening or re-training muscles which may have contributed to the injury. The aims of a patellofemoral pain rehab program are to decrease pain and inflammation, strengthen the weakened muscles of the knee and hip, increase the flexibility of the tight muscles, address any biomechanical issues followed by a gradual return to training. Jumper’s knee or patellar tendonitis is an overuse injury that results in pain at the front of the knee localised at a point at the bottom of the kneecap. Repetitive strain from running or jumping causes inflammation, or more likely, degeneration of the patella tendon. The bottom of the kneecap will feel very tender and may seem larger than the other knee. It is likely to ache and feel stiff after exercise, and neglecting this injury can cause it to become worse and a chronic problem. The aims of treat rehabilitation of Jumper’s knee are to reduce initial pain and inflammation, stretch the quadriceps muscles, strengthen the tendon and muscles, in particular, eccentric strengthening exercises are most important. Read more on Jumper’s knee. Osgood Schlatters disease is a very common cause of knee pain in children between the ages of 10 and 15 years old. Pain at the top of the shin (tibial tuberosity), just below the kneecap, is the main symptom becoming swollen and inflamed. Symptoms will worsen with exercise and improve with rest. It is something children will usually grow out of, but treatment and ‘management’ of this injury are essential. Treatment options include reducing pain and inflammation by applying the PRICE principles of protection, rest, ice, & compression. In particular, rest is important, so managing a child’s training schedule so they have adequate rest whilst allowing them to the more important training sessions if able is the aim. 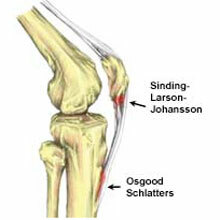 Read more on Osgood Schlatter Disease. Sinding-Larsen-Johansson lesion or syndrome affects young athletes and children causing pain at the front of the knee, at the lowest point of the patella or kneecap. The bottom of the kneecap may feel tender and the pain will get worse during and after exercise. Symptoms are very similar to Jumper’s knee, but the injury is more like Osgood Schlatter’s disease in that the point where the tendon attaches to the bone reacts as tendons and soft tissue have not adjusted to new bone growth. Chondromalacia patella (CMP) involves damage to the articular cartilage which is the smooth hard cartilage under the kneecap. Symptoms are similar to patellofemoral pain as the kneecap rubs on the bone underneath causing swelling and pain. Pain can worsen when walking down stairs or after sitting for long periods. A grinding or clicking feeling may be felt when moving the knee. Read more on Chondromalacia patella. Housemaid’s knee, also known as prepatellar bursitis or knee bursitis, is a swelling of the bursa at the front of the knee. 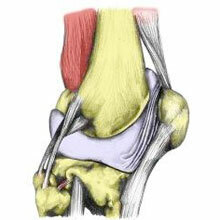 A bursa is a small sac of fluid whose function is to lubricate the movement between tendons and bone. 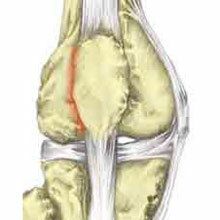 Pain and tenderness at the front of the kneecap is the main symptom and may be accompanied by swelling. 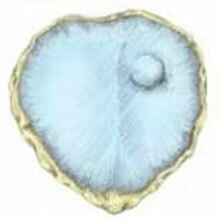 A lump may be visible and the kneecap may be warm to touch. Kneeling will often be painful. 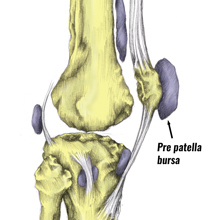 Infrapatella bursitis occurs when the infrapatellar bursa below the kneecap becomes inflamed. Pain at the front of the knee and swelling are the main symptoms. The symptoms are similar to those of Jumper’s knee. Read more on knee bursitis. The synovial plica is a synovial fold found along the inside of the kneecap causing pain and discomfort. It is sometimes be confused or misdiagnosed as patellofemoral pain syndrome as the symptoms can be similar. Symptoms of a synovial plica include a sharp pain at the front inside edge of the kneecap. The pain may also be towards the back of the patella. The athlete may feel a sharp pain when squatting. A synovial plica may sometimes feel like a thickened band under the inside of the kneecap. 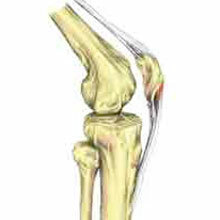 The knee joint is lubricated with a substance called synovial fluid. This fluid is surrounded by and produced by a sheath called the synovial sheath. The synovial plica is a synovial fold found along the inside border of the kneecap. The synovial sheath may also become more widely inflamed. This is known as knee synovitis. A synovial or patella plica should be considered the main cause of pain only when the patient has failed to respond to treatment of patellofemoral pain syndrome. 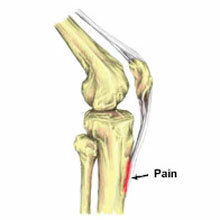 A surgeon may perform an arthroscopy to look into the joint, identify a plica and remove it. Patellofemoral instability can occur through a number of anatomical or genetic causes, or it can result from a previous patella dislocation injury. The injury usually involves the patient having a sensation of their kneecap ‘slipping away’ or feeling loose on a movement of the knee. The front of the knee may be painful and swollen. Read more on Patellofemoral instability. Overuse causes pain and inflammation of the quadriceps (thigh muscle) tendon to the point where it attaches to the top of the kneecap or patella. Over time this can lead to degeneration of the tendon. Pain around the top of the kneecap that increases during and after exercise is the main symptom. The pain may also be reproduced when standing up from a crouched position, contracting the quadriceps muscles or pressing in at the top of the knee. Read more on Quadriceps tendinopathy. The infrapatellar fat pad is also sometimes known as Hoffa’s pad. It is a soft tissue that lies beneath the kneecap which can get impinged, causing knee pain. This knee injury can be caused by a severe impact which traps the pad between the patella and femoral condyle. Tenderness at the bottom and under the kneecap can suggest this injury, and sometimes the kneecap seems to tilt outwards, because of swelling. Read more on Fat pad impingement. Other causes of pain at the front of the kneecap which always be considered include pain referred from the hip or lumbar spine, Osteochondritis dissecans, Slipped capital femoral epiphysis or Tumors, especially in young athletes.